beathespread: Geopolitics Russia: Find the 7 differences! Geopolitics Russia: Find the 7 differences! Pro-European protesters and Pro-Russian protesters. Find the differences! Is there any deeper geopolitical meaning of the struggle in Ukraine? I think Putin is tryinging to establish the old two pole model from the cold war. In that model Russia was one of the colossal powers. Well, the only power able to destroy the US. This the game of Putin is twofold. Restablishing Russia as a mobilized force in the world arena and reinforcing beyound any democratic standards his reputation within Russia. While the pro-western protesters use the somewhat cool methods of unarmed struggle of Gene Sharp the pro-russian protesters look more like special forces specially trained and equipped. 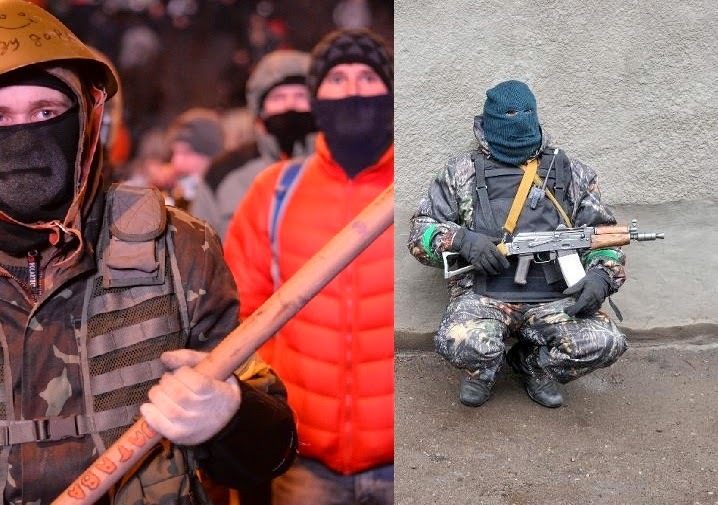 If we compare the US should send Delta Force and Marine Recon to protest over the Maidan. If it was not deeply sad that would be hilarious. The Russian stocks are falling. They will become highly speculative in this moment. Yep, Ukraine is a big challenge for Putin. I made the prediction Putin will grab Ukraine soon or late, and the current events are going in this direction. There is another story behing Ukraine. by this way Putin shows his disagrement about the futur Transatlantic Trade and Investment Partnership (TTIP) between Europa and USA. Your predictions amazed me. Something big is going on. The big thing is who is going to dominate the world. Maybe we pass from the transition of global US hegemony to shared multipole hegemony. Japan is militarizing quickly too. As far as I wrote here on this web site, those current years until 2016, there will be negociations between USA, Russia and China and things will be smoothed. Today, there is a potential risk of a crash market around end of april to may-June 2014, there are also a lot's of money (trillions of dollars) not invested in futures, actions or in any enterprises. For 2017, there is a risk of a blockage (in negociation deals). Russia is not against the american people, but in confrontation w/ the american government and their goals. Here, in France, Francois Hollande got the risk not to being able to finish his mandat as president. When Ukraina will fall in Russian's hands, there will be a risk for Romania, Lettonia too to follow into the same way. After watching this political game, I can tell (as a chess player) , that the strategy used, is like creating a quick and non-expected counter-attack on the most critical and fragile point from Europa forces. At the same time, this is the way to create blockage on the transatlantic trade and investiments. Pro Russia TV: La verite toute entiere. The question is to think what would be the economic consequences of all this. Europe really hates the idea of making economical sanctions to Russia, the US do not care at all. I think US is really happy with the crisis because this crisis will make weaker both Europe and Russia. Russia is going to be more or less isolated by reigniting the cold war concepts. Putin on his hand sees his public image with a hero status. That means that his dominance in his own country cannot be disputed. So even if it may be bad for Russian in the long term it is good for his politics. Russian people feel like germans at the beginning of the WW2. They really like the idea of annexation of Crimea. They felt humiliated by loosing the invincible imperial status after the scission of USSR. The same humuliation was for germans after loosing WWI. The historical parralel is too similar to be ignored. The germans pretended to act in Poland in order to protect their own German population being oppressed by polish. The Russians pretend that Russians are being oppressed within Ukraine. Oh man that is the same. You should take a look in an original Russian forum, Russians really believe that their cause is just and right. Some consider that they are self sufficient and that they need nobody no foreign trade at all. And most of all they are ready to take the economical consequences whatever they may be. As for Europeans we will see our land drilled and poisonned by greedy US corporations for Shale gas, instead of benefitting of the Russian natural gas reserves. The guys who ignite the war are evil geniouses, now slav people are killing slav people, brothers are killing brothers. Bad consequences for all but several corporate shareholders. Another point that Russia can not tolerate anymore, NATO wanted to install nuclear nukes in Ukraine this year. Tom is great. Thank you for the link. Paradoxally the solution of the crisis is exactly what Putin and the pro russian activists demand for Eastern Ukraine. More authonomy and federalism. That is the only peacefull solution of this crisis. The problem is how to make the parties to accept that without being humiliated. Even if the people go home the end result will be much worse and will lead to bigger crisis lately. The truth is that the EU cannot be enforced by force. That is the whole idea of the EU. You can't force the Eastern Ukraine to be bound by the EU regulations. Especially because the EU is not paradise. The EU will lead to BIG social sacrifices in the future. Those sacrifices can be taken only by people who are prepared and willing to do so. The whole EU project is corrupt and needs Reengeneering. If you force social sacrifices to people who are not willing to take that. That will lead to BIG European crisis much worse than the localized Ukrainian crisis. Take for example Bulgaria. What happened? As an EU country really nothing happened. The country still remains the poorest EU country. The full competition rules made the home industry uncompetitive. The uneployment is very high. The only thing that keeps going is the money sent in the country by the relatives living abroad. That is what is going to happen in Eastern Ukraine. The industry is going to be destroyed. The people are going to be unemployed. The corruption will flourish. The EU has lost itself. All the good EU projects in my country are taken by well connected people (the Oligarchy). Now the Bulgarian Oligarchy is going to be represented again in the European Parliament. How legitimate this EU Parliament can be as we see that means of political engeneering a key oligarchic figure (Delian Peevski) is going to be represented there because as a product of electoral law engeneering. What those East Ukrainian people see in Putin. Putin is just a man. But a man who reestablished Russia as a global player. The man who stopped the massive stealing of Russian natural ressources by a small company of Oligarches. A man who will take care of the small people and make them live in relative confort. A man who will keep their jobs. Those people want just that. In their eyes the actual ukrainian government is illegal and came into power be the complex US social engeneering. What really US want is that they create an unresolvable conflict between EU and Russia. US fear a lot a strong connection between EU and Russia. Imagine technologically strong EU with Russia full of energy ressources and manpower. That is a very bad dream for the US policy makers. Together EU and Russia are stong enough to challange the US hegemony military and economically. Now all the media coverage is targeted towards the public opinion and its sentiment. Putin the bad guy ready to nuke you if necessary. US as good guys but helpless. End result: turn to US isolate Russia appears as the only choice. I thing I would make a new blog post based on the above comment. This a trial to have an overlook over the crisis and remaining objective. Nevertheless I like the sense of humour aspect. 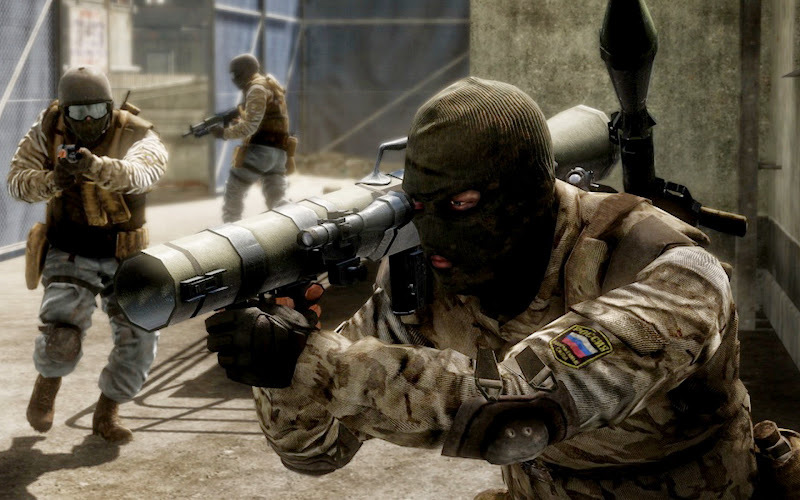 Pro Russian protesters and Counter strike. LOL. The roots of those troubles comes from the fact, at the NATO Bucarest commit, the conclusions were NOT to include Ukraine and Georgia in NATO, but only get partnership (like for training). Also, the people at the head of EU, ahve no european identity. They act if they were leading a minor or sub USA. That's is not in the spirit of the Europa birth. The first aim of Europa is : - to build a common and peacefull land, after the horrible events of the WWII. As far as I know, Russia has paid a huge tribute in this war, and have to be considered as best friend, even if the american way of life got European people. it isobvious that there are some dark forces which seek a further intensification of the conflict. I see all the recent provocations as such things. It is very ugly. I mean it is very ugly to kill people for making provocations. The people are considered like pawns that can be sacrificed with such an ease. Thank you the English subtitles on youtube work quite well. Thank you for the links they are most appreciated. For the moment I stick with my analysis further posts ago. War games are the games which Putin masters to perfection. You can't play wargames with Putin. Something else should be done but what this is a millions dollars worth answer.